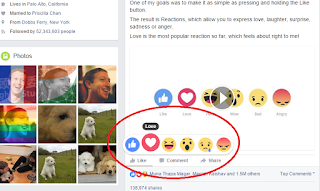 Facebook has launched Reactions as "an extension of the Like button, to give Facebook users more ways to share your reaction to a post in a quick and easy way" according to an official press release. Personally as an internet user since 1999 and as a social media consultant since 2009, I think, from my own point of view, that Facebook will discontinue this feature sooner or later for four reasons. First Reason: Reactions Are Ignoring Usability Rule # 1: Do Not Make Me Think! Social media's top advantage is its success to convert our complex interactions as human beings into just one simple action without too much thinking (like, retweet, share, etc). The new Reactions are just complicating things because like, love and wow are more or less all similar to each other. Simply, Facebook users will need to think, even for a fraction of a second, whether to wow, love, or like a Facebook post about sunny day after series of rainy days. Second Reason: Facebook Page Insights - No Updates! As a social media and digital marketing agency, we obviously need to analyze Facebook page insights. Although Reactions are live now in Egypt but no changes are there at Insights tab. The tab's right column there was just updated to count reactions (instead of likes), comments and shares. For example, no automation is available to find out the percentage of love clicks to our posts compared to wow or angry clicks for example. Unfortunately, Facebook's doesn't mention, officially, anything related to Page Insights. Some advertisers who are running Facebook advertising campaigns are being charged per engagement and hence will pay for someone who marked their promoted post with angry reaction. How this will work for advertisers? Can this mean irrelevant audience selection for example (Before Facebook Reactions, users were able to report such irrelevant ads)? Or will Facebook show ads to those who are not familiar with marking advertiser's similar posts with angry reaction? Here are different insights from the advertisers reaction on Wired. What is the impact of allowing Facebook users to express negative feelings on the platform? For a post about the death of colleague's husband before Facebook Reactions, users were just OK with ignoring that post, or sharing it with sympathy statement highlighting funeral location, or with commenting on the post supporting the colleague. Now, Facebook users will be able to simply mark the post as "Sad" and that's it which spreads more sadness online. However, Facebook announced officially that "it will initially use any Reaction similar to a Like to infer that you want to see more of that type of content. Over time we hope to learn how the different Reactions should be weighted differently by News Feed to do a better job of showing everyone the stories they most want to see"
Will Facebook assign different weights to different reactions (love versus wow for example)? Or will Facebook show more sad posts to those who are engaging more with sad posts and that's it? Do you think Facebook will really discontinue Facebook Reactions? Let us know what do you think ladies and gentlemen. Share your feedback with us.